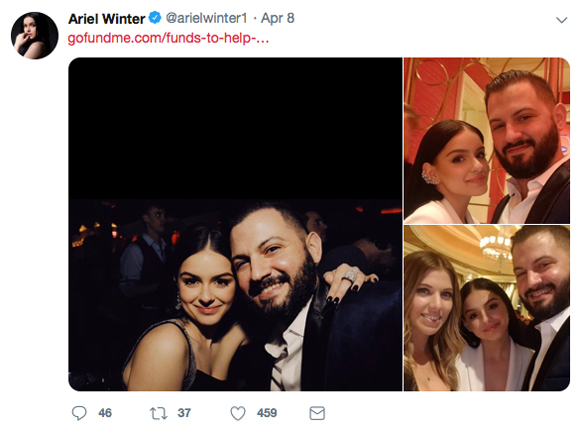 Ariel Winter claps back after asking fans to donate to her cousin’s GoFundMe page. Per the donation website, on April 5, Tino Tsutras was rushed to the hospital and put on life support where doctors later determined that he suffered from Haemophilus influenzae, a type of bacteria that can cause different kinds of infections. Though he is currently out of the ICU, he is still under close monitoring, and will continue to undergo tests in the upcoming days. To help with his living expenses, a GoFundMe account was set up, which (as of this writing) has raised over $21,000. 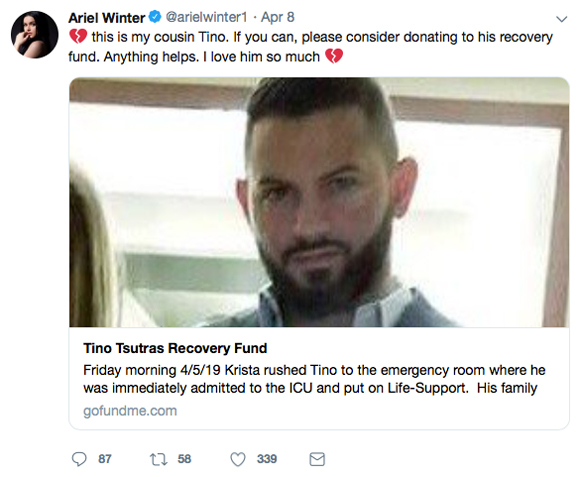 On Monday, the Modern Family actress posted a link to Tino’s donation page on Twitter, asking fans to donate to his recovery fund. However, after the post went viral, social media users SLAMMED the 21-year-old for asking for money when many believe her to be a successful, wealthy actress. In an interesting twist, costar Sarah Hyland also received criticism when she promoted a GoFundMe page for the family of her 14-year-old cousin Trevor Canaday, who was killed in an alleged drunk driving accident. According to The Blast in December 2018, the man who allegedly caused the crash, Jeffrey Eggeling, was charged with three felonies: motor vehicle homicide with a DUI prior conviction, DUI causing serious bodily injury, and leaving the scene of a personal injury accident resulting in death.